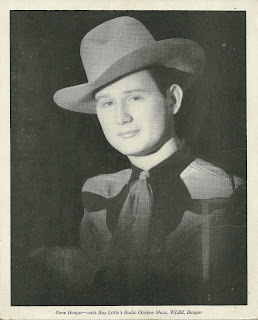 Large publicity photo of Gene Hooper, back when he was with Ray Little's Radio Cowboy Show, WLBZ Radio, Bangor, Maine. His career started in Maine and Atlantic Canada and then spread farther afield, including a stint with WWVA of Wheeling, West Virginia's and the World's Original Jamboree show. At one point, he performed on the radio every day at midnight with Crazy Elmer. He was born Eugene Merrill Hooper on 22 November 1923 in Machias, Maine. He and his wife Flo had 5 children. Flo and daughter Sharlene, both talented singers, performed with Gene as the Gene Hooper Family Show. I understand that he's retired now, but he continued to perform into his eighties. Fittingly, he was inducted into the Maine Country Music Association Hall of Fame in 1980. Hopefully you will enjoy this memento - thanks for stopping by! I miss you Pappy, we all do. If Grammy Flo is on her way to you, I would love to see your smile when you see her. We will miss you both VERY, VERY, MUCH, but for now we pray to have Grammy for just a while longer if she's spared the pain. Your never far from our thoughts & always close to our hearts. In a sense we are not far behind you. Take care of Grammy Flo.